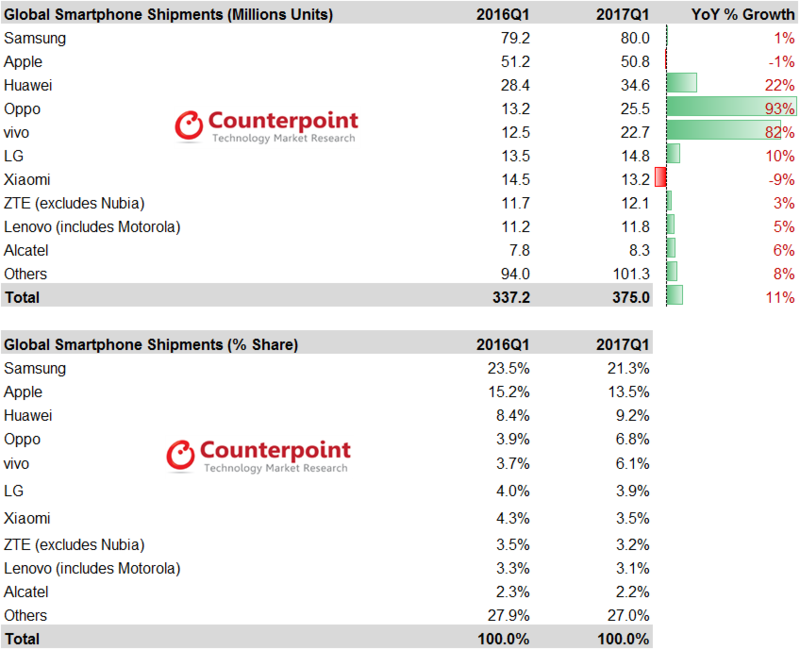 According to the latest research from Counterpoint’s Market Monitor service, global smartphone shipments grew 11% in Q1 2017 compared to Q1 2016. This is a stark contrast from the -2% decline Q1 2016 endured. Smartphone shipments reached 375 million units in Q1 2017. The smartphone market grew 11.2% annually. Smartphone penetration reached over 80% of the mobile phones shipped in the quarter. Top 10 brands contribute to almost 73% of the smartphone volumes in Q1 2017. Premium segment ($400 above) smartphones now contribute to almost 20% of the global smartphone market. 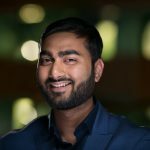 However, the segment declined annually due to softness in iPhone volumes and controlled inventory of the Samsung flagship Galaxy S7/S7+ ahead of Galaxy S8 series launch. 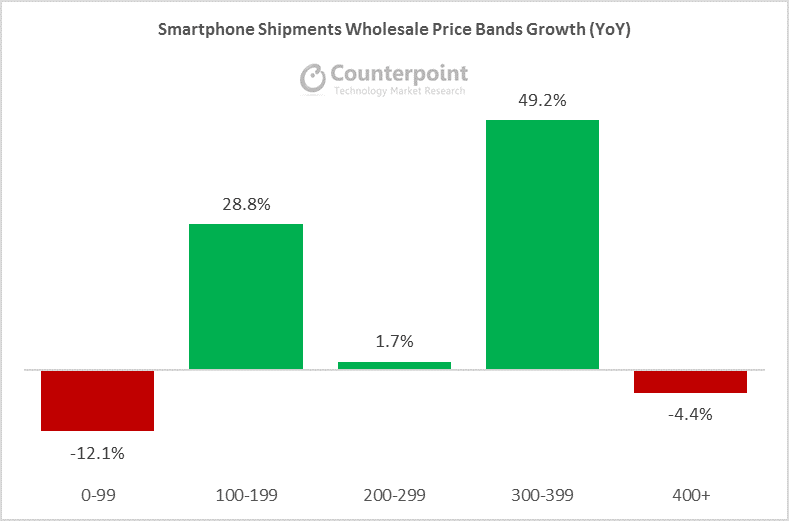 The ‘affordable premium’ segment $300~$399 was the fastest growing smartphone segment during the quarter mainly driven by OPPO, vivo and Samsung A series smartphones. The $100~$199 price segment has quickly become the sweet spot across the pre-paid developed and emerging markets. This segment accounts for one in three smartphones shipped globally, registering a healthy 28.8% growth in Q1 2017. The $100~$199 price segment is mainly driven by Samsung’s J series, Huawei’s Honor series, OPPO’s A series and Xiaomi’s Redmi series smartphones. Together these brands accounted for almost half of the volumes of the price segment. Samsung regained the top spot from Apple in Q1 2017 due to higher than expected shipments of 80 million smartphones. We believe Samsung ended the quarter with significant inventory of the new A series and older J series smartphones. However, the flagship inventory was streamlined during the quarter building a stronger base for the promising Galaxy S8/S8+ launch in Q2 2017. Samsung led the smartphone market by volume with a market share of 21% in Q1 2017. Its smartphone shipments recorded a marginal growth of 1% annually during the quarter. Coming off a strong holiday season quarter, Apple shipped 50.8 million iPhones, down 1% annually. The iPhone shipments were below market expectations considering the strong demand for the new iPhone 7 series compared to the iPhone 6S series. Apple has yet to reach the peak Q1 2015 quarter shipment levels which it saw with the iPhone 6 series. Softness in China remains the key factor holding back Apple’s iPhone growth. Huawei shipped record first quarter shipments of 34.6 million units, up 22% annually. According to our monthly Market Pulse report for Q1 2017, Huawei, like Apple, registered a healthy sell-through clearing most of the excess shipments at the end of Q4 2016. During the quarter, Huawei launched its latest flagship, the P10. This should help Huawei increase its share in the premium smartphone segment, which stood at 6% at the end of Q1 2017. However, looking at the latest bezel-less flagship launches from the vertically integrated Korean vendors, Huawei will face tough competition in flagship segment. OPPO and vivo were the fastest growing brands during Q1 2017, continuing the strong momentum of the second half of 2016. China, India and SEA remain the key growth markets for these brands. The companies captured one of the top three spots in most of these markets. Both OPPO and vivo have been successful in driving the high tier ($300~$399) price segment by offering affordable premium smartphones with innovation across design, camera and battery technologies. LG registered 14.8 million smartphone shipments in Q1 2017 with strong performances in North America, LATAM, and Korea. The company’s shipments grew 9.6% annually in the first quarter. The mid-tier K series smartphones were the major driver for LG during the quarter. Xiaomi shipped 13.2 million smartphones, capturing 3.5% market share of the global smartphone market in Q1 2017. India was the bright spot where shipments grew 283% during the quarter, which somewhat offset the continuous decline in its home market. Redmi Note 4 was the key volume driver for the company during the quarter. ZTE had a relatively softer quarter with 3% annual growth. The company registered growth in some markets such as North America. The performance in Western Europe, MEA and Asia was weak during the quarter.